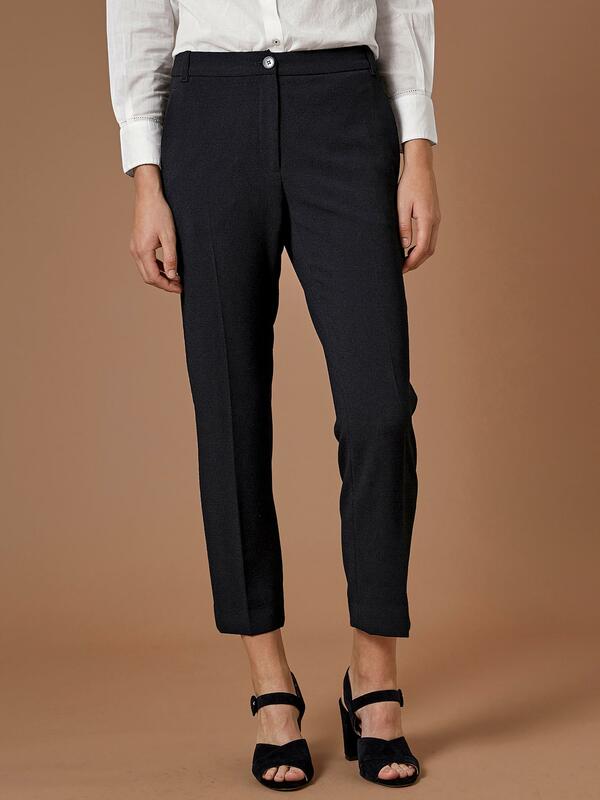 A chic urban look for these cigarette trousers in crêpe, working style. An ultra-quality which changes everything. More flowing style, sharper drape, ultimate comfort: the new crêpe has arrived! Cigarette leg, tapered, and cropped (7/8 length). Waistband with belt loops. Zip and button fastening. 2 slant pockets at front. Mock piped pockets at back. Marked crease front and back. Inseam 68cm, leg width 18.5cm approx. Ultra crêpe, 95% polyester, 5% elastane. This fabric combines polyester and elastane for flowing style and perfect drape. Soft, hardwearing, wrinkle-resistant, comfortable and easy-care: we selected a crêpe of exceptional quality for these trousers.